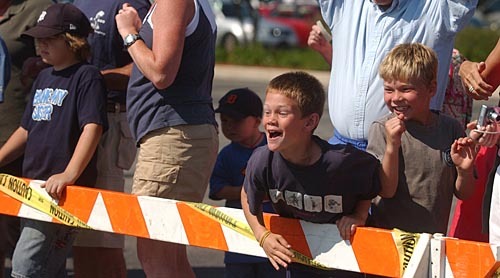 Seven-year-old Henry Shaban, center-right, of Redding, Conn. celebrates with cousin Wiley Fraser, 8, the first place finish of Wiley's brother Payson Fraser, 5, during Saturday morning's National Cherry Festival Big Wheel Race at the Preferred Outlet Center in Traverse City. Wiley, his brother Payson and their dad Tobin Fraser have all won and participated in the Big Wheel Race. Tobin participated in the festival's first Big Wheel Race in 1971.